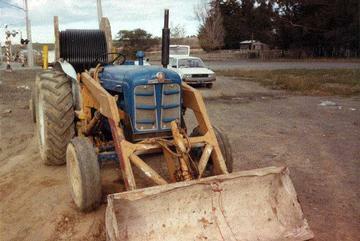 This tractor is fitted with a FEL from an industrial Massey Ferguson. The tractor is equiped with the live PTO and raised PTO options. It can be seen here hauling a 7ton cable jinker on the North Island Main Trunk Railway Electrification Project, New Zealand in 1985. During the summer months the FEL was removed and the tractor was employed on hay duties.